Thoughty: Five or So Questions with Evan Rowland on Noirlandia! Five or So Questions with Evan Rowland on Noirlandia! I have an interview today with Evan Rowland about Noirlandia, an RPG based on Questlandia involving a murder mystery! It sounds like a really fascinating game experience. Check out the answers below, and look for Noirlandia on Kickstarter! Tell me a little about Noirlandia. What excites you about it? Noirlandia is a one-shot, collaborative murder-mystery game in a fantastic setting. 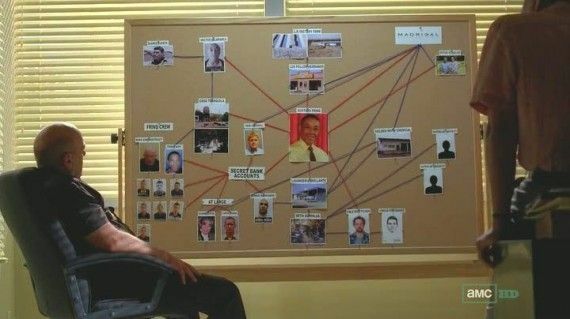 You use an actual corkboard, and the rules tell you how to pin up leads, connect them together with yarn, and combine your information to get answers on the case. As you work on the mystery, you learn more about the corruption of the unique city your group made, and put your character's principles to the test. I'm excited about the game for a lot of reasons! I love the worldbuilding elements - bringing a noir-style mystery to historic London, a colony of dragons, or a meteor mining outpost. I love creating the classic crime board - I've always been fascinated by them. And I love how the game emphasizes big political machinations. I'm hoping it can invoke some of the Chinatown feel! Tell me about the crime board and how it factors into Noirlandia's main gameplay. How do the players and mechanics interact with it? To win a game of Noirlandia, you need to find 3 answers: Why was the victim murdered? Who did it? How was it pulled off? To get those answers, you need to assembles leads and form connections between them. The crime board is where that's all assembled—an actual cork board where you pin up your leads, connections, and answers, divided between the 4 districts of your city. Both leads and connections come from successful investigation rolls. A lead is a person, place, or object—it could be the victim's therapist, an underground parking garage, or a stolen statuette. When you find a lead, you write it on a slip of paper or newsprint, and pin it to your board. When you find a connection, you can tie a string between any two leads—maybe the therapist stole the statuette! To get answers on the case, you need to connect 3 leads together. But there are forces actively working against you - you might find your leads destroyed before you have a chance to use them! The investigation sounds really cool. What can you tell me about character involvement in the investigation - do they factor into the plot? What about the characters matters to the investigation? Each player controls one character participating in the investigation. They come from all walks of life—your character could be a writer, a hired gun, an aristocrat, a private eye, or a role unique to the setting you created. All the characters have one thing in common—a connection to the victim, whose death kicks off the mystery. The story follows multiple threads, as each character tackles the case in their own way. Some games have the characters joining forces, while in others, paranoia or betrayal between characters leads to solitary investigations. Your group might not be working together directly, but everyone's progress on the case brings us closer to solving the crime. And Noirlandia is always cooperative on a player level, even when the characters are at odds. Finally, in every story, characters see their defining principle put to the test. If your character’s guiding principle is, “tell no lie,” the mechanics will throw you into situations where you’ll either have to lie to a loved one or risk losing the thread of your investigation. What kind of resources and research did you do to create the general "feel" of Noirlandia? There's a lot of noir to watch! I've combed through movies like The Maltese Falcon, Sunset Boulevard, and Chinatown to come up with mechanics around following the thread of a mystery, putting clues together, and dealing with societal corruption. I've also been playing noir-influenced games like L.A. Noire, Grim Fandango, and Sam & Max Hit the Road. I’ve tried to make the world-building aspects of Noirlandia flexible enough to explore both serious and offbeat noir stories. What do you think happens in Noirlandia - mechanically, socially, or otherwise - that helps to make the experience unique and exciting? Mechanically speaking, I’m really happy with how the crime board is created and used. It both shows the leads that have been uncovered and the connections between them, and makes a kind of abstract map of the city. Questlandia’s kingdom-building has become Noirlandia’s city-building, and the fantastic settings that result have been my favorite part of the game. Noirlandia uses noir plots and pacing, but allows you to inject fresh ideas into the genre. It’s a great chance to shake up the familiar tropes and tell new kinds of stories within a murder-mystery framework. We have an amazing group of stretch goal writers who are creating space opera noir, queer vampire noir, medieval fantasy noir, and Nintendo noir. It’s been so exciting to see these settings come to life in the game!